Topend Sports has teamed up with the software developer Bitworks to provide the most versatile and useful software for conducting beep (bleep) type tests and saving results in real time directly onto your computer. For a similar price to buying the Beep Test cd, the Team Bleep/Beep Test software provides the standard Multistage Fitness Test or Bleep Shuttle Run Test right on your PC or Laptop (or on a Mac with Windows simulation (virtual box), with all the following additional features that you do not get with just the test cd. ACCURATE REAL TIME DISPLAY — the Beep Test application is accurate to 1/100th of a second and provides real-time on-screen display of stage numbers, distance covered and VO2max. RECORD AND REVIEW RESULTS — The software provides an easy way to record player scores at the click of a button, including distance run and VO2max. The saved results can be viewed and printed using the graphical statistics screen. TEAM FUNCTIONS — If you are using the software with a team or other group, there are many useful features. You can enter all team player names, and during the test player buttons provide one click recording of results. These results can be graphically displayed as soon as the test is complete, comparing player results over time. The player results text file can also be imported into excel for further analysis. The latest version has the added capacity to track multiple teams of players (useful for schools with many classes or sporting clubs with many teams). MORE TESTS — not only can you conduct the standard beep test using pre-designed scripts, you are able to perform other beep type tests such as the yo-yo test. The software comes with a scripts for the standard Leger beep test, the YoYo Intermittent Recovery and Endurance Levels 1 and 2, and a 15m beep test used by UK Police and Fire Services. Plus there is a online library of custom scripts which you can download and use with the software. DESIGN YOUR OWN TEST — as well as running the test scripts that are available, the software allows you to design your own test using a few simple commands in a script file. With the simple commands of Start, Run, Rest and Repeat, all types of beep type tests can be replicated. For added flexibility the lap distance and running speeds can also be adjusted for different sports and the software has even been adapted for swimming. CREATE CDS for PLAYBACK — The software license is for one computer only, however you can create unlimited copies by recording the software audio (needs additional software). 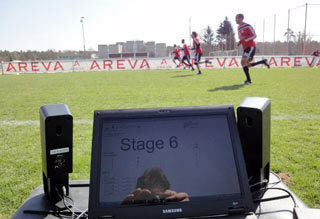 The Team Beep test software is being used by many top sporting clubs around the world. Here is just a selection of the feedback that has been received. "test worked out perfect ... just the guys where complaining :)"
"The program looks good ... thank you very much"
"The software worked well, and we hope to continue to use it"
"I am very happy with the program, perhaps other ski coaches will also buy. Greetings from Switzerland, Didier"
"Many thanks for this, it is a lot more flexible than I thought. I'm impressed with the ability to design individual tests with rest points. Regards, Andy"
"Your software runs perfect! ... Best Regards, Itaru"
The Team BeepTest Software shows the test progression onscreen. You can add and edit team member details. We have detected that you are currently using a operating system - be aware that the Team Beep Test software only currently runs in the Windows environment. It will not run on a Mac computer withour added software and setup using virtual box Windows simulation. Also note that this is not the traditional beep test cd (if that is what you are after, see purchase details here), but a more versatile computer software that can play the beep test plus much more. After purchase you will be able to get the unlock code to unlock all the features of the software. Click the buy now button below to make your purchase. The payment is processed by the secure systems of PayPal, all major credit cards are accepted. * The exact amount paid will vary with the current exchange rates. Conversion to your currency is automatic when the payment is made. Once you have completed the payment, you will be directed to a webpage with details of how you can unlock all the features of the software. If you have any questions about the purchase procedure or any issues with downloading the software, please contact Topend Sports. Any software related questions need to be directed to Bitworks. Their contact details are also contained within the software. For more information, and possible answers to your questions, see the FAQ. Latest Version - If you have previously purchased the software, you may be elibible to download the latest version. Contact Bitworks for details. Do you need more copies? - In order to install the software on more than one computer you need to purchase extra licences. For extra copies, an alternative is to burn the test audio onto a cd then play it on any cd player. Custom Script Library for the Team BeepTest Software. Also instructions on how to create your own scripts. See the Frequently Asked Questions for answers to common questions about this software. Instructions on how to burn the test audio onto a cd. For comprehensive information about the beep test, see the Beep Test Home. See also detailed instructions for conducting the beep test and shuttle run video examples. There are other options for buying the Beep Test cd. Guide to variations of the beep / bleep test including the Yo-Yo Intermittent Test. What's your best score? — some beep test results of athletes.